MONTEBELLO – There’s a new watchdog group in town and their demanding changes. 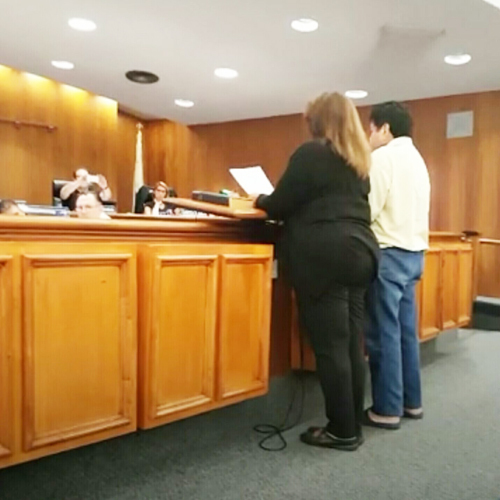 They sit in the front row at nearly every Montebello City Council meeting, keep a close eye on city business, read through agenda packets and regularly make public document requests, all in an attempt to hold their elected officials accountable. Among their successes so far, getting the city to start live-streaming city council meetings. Now they’re trying to block efforts to allow marijuana-related businesses to open shop in their city, and keeping an eye on issues brewing in the Montebello Unified School District. No strangers to city politics, the grassroots group’s members have spent years attending city council meetings and public hearings, often serving as Montebello’s most outspoken critics. The activists haven’t always been on the same side of issues, but anger over the latest effort to allow marijuana related businesses to operate in the city led them to put aside their differences and work together. What they have in common is a strong interest in making the city more transparent and accountable to residents. 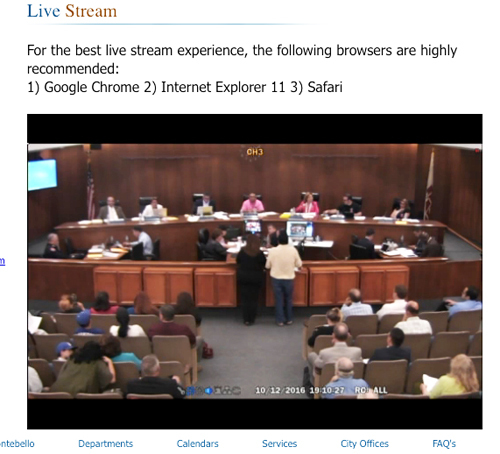 Montebello City Council meetings will now be streamed live online on the city’s website. “We want our voice to be heard and we want to get residents involved,” Cobos told EGP about the collaboration, started in August. Last week’s resignation of City Treasurer Charles Pell has added to their resolve. In their eyes, they’ve lost an ally who like them has been working to expose mismanagement and discrepancies in the city’s finances. Pell, a federal prosecutor by trade, announced his resignation during the Oct. 12 council meeting. He cited an increase in his caseload as the reason for his departure. In the last year, Pell put the spotlight on a housing developer that owes the city $600,000, staff’s failure to collect rent on a city-owned property, and questionable practices in the city’s bidding process. The city council will appoint Pell’s replacement. Cobos worries their choice may not be as willing to work hard on exposing the city’s financial failings. Although the group is relatively new, MATCH90640 is already claiming a major victory in their fight to make the city more transparent. They claim the announcement last week that effective immediately all Montebello council meetings will be streamed live on the city’s website, is the direct result of pressure they put on City Clerk Irma Barajas to keep her campaign promise to ensure greater transparency in the city. “Not many residents attend meetings, but now those who can’t make it can be kept up to speed with city issues” by viewing meetings online, MATCh90640 member Yvette Fimbres told EGP this week. The marijuana dispensary controversy that initially pulled the group together has not gone away, but is instead gaining steam. Residents packed city council chambers last week, where speaker after speaker demanded the council place a moratorium on all marijuana businesses within city limits. “We’re not activists against personal use or medical use,” Linda Nicklas clarified. “What we don’t want are growers like the ones from Glendale opening businesses across the alley from Eastmont Intermediate,” she told council members, referring to an incident earlier this year when Montebello Police discovered nearly 1,400 marijuana plants in two commercial buildings located next door to the Montebello school. According to Nicklas, all the residents she’s spoken to are opposed to allowing pot shops to open in the city. Grant Pstikyan and the others circulating the petition to get an initiative on the ballot – which if passed would amend the City Code to allow and tax marijuana businesses in Montebello—are ready to set up shop in the city, Nicklas claims. The city’s zoning code currently prohibits medical marijuana dispensaries. If you allow this measure to move forward, MATCH90640 will go door-to-door to inform residents of your decision, Nicklas promised council members. The council has instructed staff to put discussion of a moratorium on marijuana businesses on its next meeting agenda. They say they plan to conduct a full review on the issue before deciding on a permanent amendment to the municipal code. MATCH90640 told EGP their plans go beyond city hall, explaining they are also keeping a watchful eye on Montebello Unified; most of the city’s children attend District schools. The group was at the Oct. 6 MUSD Board meeting to recruit members to their cause. While at the meeting, they learned about the conflict between the Montebello Teachers Association (MTA) and the District’s superintendent, Susanna Contreras Smith, who along with Chief Financial and Operations Officer Cleve Pell on Friday were placed on paid administrative leave Friday. The decision comes months following vote of no confidence by the teachers’ union, which asked the Board of Education to fire Smith. Assistant Superintendent Anthony Martinez will serve as interim superintendent. MATCH90640’s goal is to keep residents informed on issues in the city and they say they hope the community will come to them with their concerns. You don’t have to live in Montebello to join the group, membership is open to anyone with a child at a Montebello school, who does businesses in Montebello or plays sports at a Montebello park, according to Cobo. Two men were arrested for allegedly growing hundreds of marijuana plants in two commercial buildings next door to one another in Montebello, police reported Wednesday. Nicholas Stone, 23, of North Hills, and Artin Khudanyan, 32, of Glendale were arrested Tuesday and booked on suspicion of planting, harvesting or processing marijuana, said Montebello police Lt. Andy Vuncanon. Each suspect was released on $50,000 bail, and both were preliminarily scheduled to appear in court in downtown Los Angeles on Thursday, according to the sheriff’s department. On Tuesday afternoon, officers served a warrant in the 3300 block of West Beverly Boulevard, across an alley from Eastmont Intermediate School, and found 700 marijuana plants worth about $300,000, Vuncanon said. Investigators found a fully operational marijuana growing operation, with artificial lighting, ventilating fans, temperature control and an odor control system and soil/nutrients for the plants, Vuncanon said. Investigators obtained a search warrant for the second location, and served the warrant later Tuesday night, Vuncanon said. “Once inside the commercial property, investigators once again identified a fully operational marijuana grow equipped with same type of operation and set-up as next door,” Vuncanon said. Police seized 500-700 marijuana plants in the second building with an estimated value of $250,000-$300,000. Montebello residents may soon have to consider whether they want to allow medical marijuana dispensaries in their city — and if revenue from taxing “pot” sales is a good reason to let them open. A petition is being circulated to place a measure on the ballot that if approved would change the city’s municipal code to allow Montebello to tax and regulate medical marijuana dispensaries in the city. To qualify for the Nov. 3, 2015 ballot, the measure’s backers must get signatures from ten percent of the Montebello’s registered voters, roughly 3,500 residents, by Aug. 7. Haik Mike Aslanian, the consultant behind the petition gathering campaign who says he grew up in the area, estimates taxing medical marijuana sold in Montebello would generate $300,000 to $1 million annually for the city. “We are being extremely conservative with those numbers,” he told EGP. If approved, Montebello would be the only city east of Los Angeles allowing medical marijuana dispensaries to operate. In 1996, California voters approved Prop 215, the Compassionate Use Act, which gave cancer, AIDS and other chronically ill patients the right to grow or possess marijuana for medical purposes. Senate Bill 420 was signed into law in 2003 and clarified the compassionate Use Act, establishing the medical marijuana program. What the measures did not do was detail specific guidelines for where dispensaries can be located or how local municipalities can regulate their operation. That led to confusion and a great deal of after-the-fact planning and regulation in some cities where medical marijuana dispensaries started springing up in neighborhoods in large numbers. One of those cities is Los Angeles where as many as 1,000-1,200 “pot shops” are estimated to have opened for business, prompting one local church official to label the city the “Wild West” of the medical marijuana frontier. 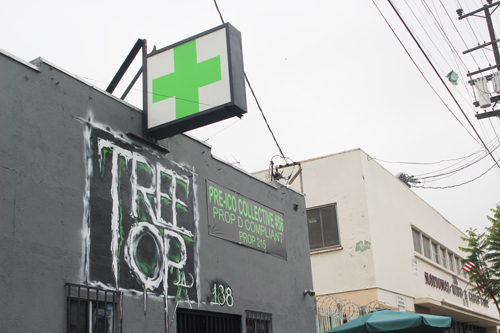 In 2013, L.A. voters passed Proposition D that makes all medical marijuana dispensaries in the city illegal except for the 100 or so that had previously registered with the city: it also sets operating guidelines. Aslanian says the measure his group is backing has taken those issues into consideration and would avoid the chaos experienced in other cities by having regulations in place before the medical marijuana dispensaries are allowed to open. Montebello’s measure would amend the city’s Municipal Code to permit the establishment and operation of up to four medical marijuana collectives. The facilities would be allowed to cultivate marijuana for medical purposes and distribute to its members. Aslanian explained they decided to go the ballot measure route to bypass city council members not likely to put forth their own marijuana dispensary measure. “It’s a hot topic,” he said. “They’re politicians and don’t want to lose votes,” he speculated. According to the petition, the collectives would be subject to an application process, operating restrictions and oversight. The dispensaries would also be prohibited from opening in residential zones, being within 1,500 feet of a high school or within 1,000 feet of public parks or any kindergarten, elementary or intermediate school, for the most part limiting the dispensaries to the city’s industrial areas. A “well regulated industry with clear operational standards, expectations and limits, will reduce the dangers presented by illegal drug dealing and potential unsafe medical products,” states the petition. He claims legalizing dispensaries would reduce drug-related crime in Montebello because patients would not have to resort to “back alleys” to score their medication. A provision for a Medical Marijuana Task Force, consisting of the city’s police chief, two members of the collective and residents appointed by the city council, has been included in the initiative. The task force would be tasked with reviewing and approving applications, enforcement, hearings, resolving disciplinary issues and addressing concerns raised by the public. “They would be able to revoke the license of a dispensary if they violate the measure,” Aslanian explained. According to Aslanian, an in-house survey found that 60 percent of Montebello residents would vote to approve the measure. He says he has family members who need access to the marijuana to help them with their medical issues and that’s one of the reasons he’s joined advocates supporting the measure. But Aslanian is no stranger to the workings of medical marijuana dispensaries; he operated one in Long Beach until the city banned the facilities in 2012. He acknowledges that if the measure passes he will apply to operate one of the four dispensaries. However, he says, the industry has changed a lot over the last two years. People and cities want more control and transparency.